This is “Worn Wallpaper” from currant newsletter. I love the look of this new paper from Tim Holtz “Lost and Found” collection. 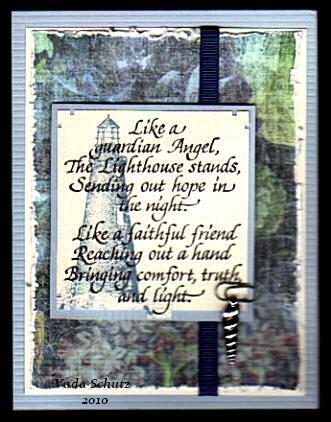 The lighthouse is from Stampscapes and “Like A Guardian” is from Stampendous. My background stamp is from TAC. Thanks again for popping in today. Beautifully done! Love the detail touch of the charm!